Masks was a real treat for me. I loved seeing into Mircea's head back before he became so powerful and had lived as long as the vampire Cassie knows today. To see him powerless and the bottom rung was really different. It's interesting to note that despite his lower power level and much less experience, at the core he was still the same man. He still was a leader and one not satisfied to just let things happen around him without him trying to fix or influence them for the better. Sure, this wasn't apparent to him at the start of this book, but the experiences in this book definitely were the turning point in him finding his confidence as a vampire. Not only was MASKS very focused on Mircea and him finding his way, there also was a fully formed plot interwoven into the story as well. Granted, it's nowhere near the typical frenzy pace of the rest of the two series, but more than enough to fully hold my attention. I loved the mix of political intrigue and the way it kept me on my toes throughout. The little hints and clues added together, and while I had my suspicions on certain things, I still was caught off guard by the big reveal at the end, which I loved. 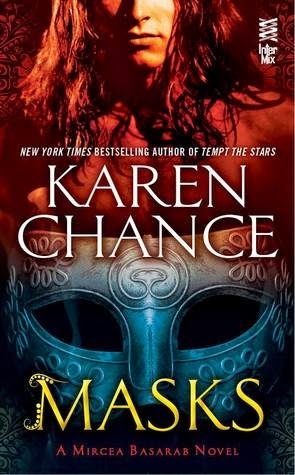 For a novel that was just supposed to be an extra bonus story, MASKS caught me completely off guard. Don't get me wrong, I knew I would enjoy the story as I love Karen's books, but I definitely wasn't expecting such a well crafted and lengthy story. What I had thought was a bonus look into Mircea's past actually wound up being a fully fledged story and one heck of a read. Trust me, this is a must read for any Cassie fan as it gives some much needed look into our favorite (or not so favorite, depending on your preference) master that you won't want to miss.